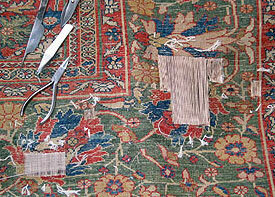 We offer expert services of Oriental rug repair for Woodland Hills. Pick up and delivery is available at reasonable cost for all of West San Fernando Valley cities including for zip codes 91364, 91365, 91367 and 91371. 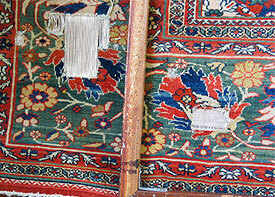 All handmade rugs are works of art. 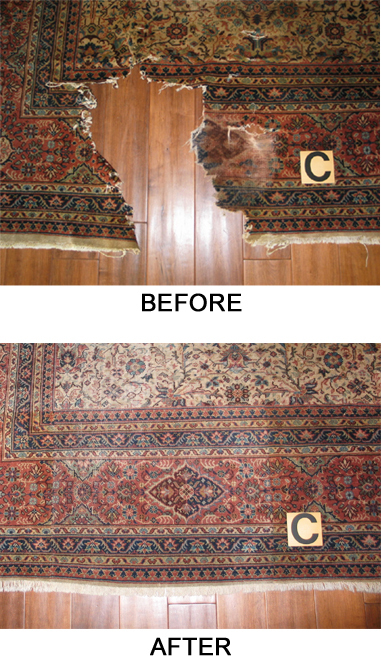 Whether antique, old, collectible, family heirloom or new, rugs should be inspected and maintained as they are used over the years. We recommend you read and follow the suggestions for maintaining and conserving your rugs as outlined in our RUG CARE section. But rug accidents happen and sometimes cause damage. So, when damage happens we recommend you seek advice on repair to avoid further losses. 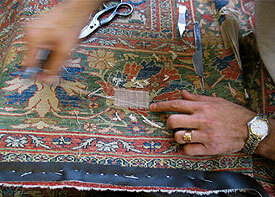 Expert rug weavers and restorers at our repair workshops provide you maintenance, repair and restoration options and services for all area rugs.